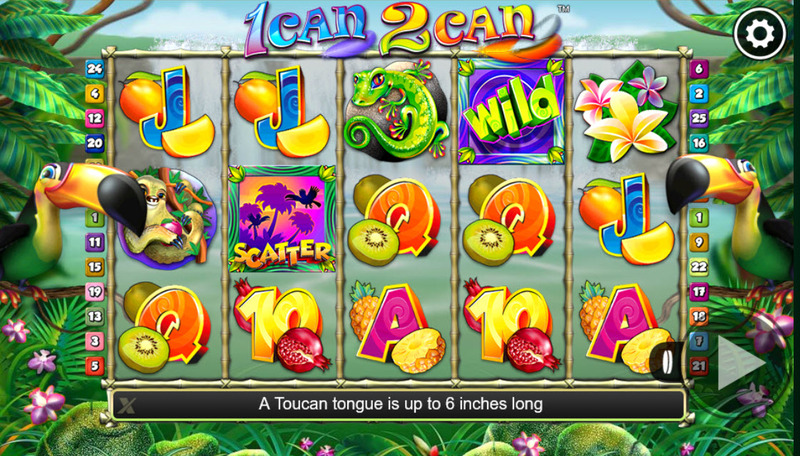 We here at Pettoucan.com want to cover everything toucan related and therefore felt that we had to write about this fun Toucan slot machine after having stumbled upon it online. 1 Can 2 Can is a play on words and is a slot about toucans (2can). It is a fun and colorful slot machine developed by Nextgen gaming. The game is old and used to be very popular. Today its popularity has veined as more modern slots have become more popular but the slot still maintains a lot of fans that enjoy the game. It is easy to understand why when you play the game. It is fun and colorful. The two toucans that help you win more money by changing symbols into wilds are also a cute touch. The game is a pleasure to play. 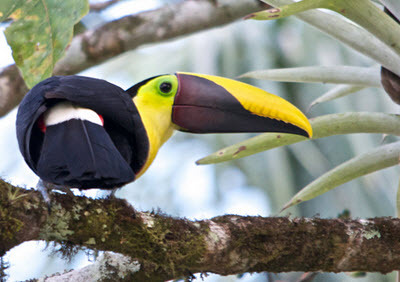 The game is centered around toucans, the fruit they eat and their friends in the forest. There is no toucan symbol in the games. The toucans are located outside the gaming area and can fly out onto the wheels. The two toucans will often eat fruits and turn the symbols into wilds. This happens every few spins and makes the game very fun since the toucans help you win very often. It is very rare that you go more than a few spins without winning any money. The toucans have two friends that are featured as symbols in the game, the sloth and the Iguana. These are the most valuable symbols in the game. Five sloths will trigger the biggest win outside the jackpot. 5 sloths will reward you with 500 coins while five iguanas give you 250 coins. Another valuable symbol is the feathers that give you the chance to win 125 coins. All other regular symbols are a combination of letters and fruits. Fruits featured in the game include passionfruit, kiwi, pomegranate, pineapple, mango, and papaya. All fruits that pet toucans love to eat. Wild toucans are also likely to like them but they are very unlikely to encounter some of these fruits because they are not found where the toucans live in South and Central America. 1 can 2 can features 5 wheels and 25 pay lines. You can set how many of these pay lines you want to play. The bet per line is fixed to one coin. The coin value can be set as low as 1 cent and as high as $10. The largest possible bet on a single spin is $250. The smallest bet is $0.01. The game has a very clean layout, and the main page only contains a spin button. You have to enter the configuration menu to change the coin value and the number of lines you want to play. The configuration page is only available between spins. The game contains wilds that can occur randomly when the wheels are spun. They can also be created by the toucans that eat the fruits on the symbols and turn them into wild symbols. The wild symbol can replace any symbol except for the scatter symbol. 1 can 2 can features a scatter symbol that depicts toucans flying over the forest at night. The scatter cannot give you free spins. Instead, they give you the chance to win money based on your total bet on that spin. (not just the bet for the winning line). You need at least 3 scatters to win. 3 scatters give you 5 times your total bet. 15 scatters give you 15 times your total bet. This slot machine does not have a bonus game. 1 Can 2 Can does not feature any progressive jackpot. The largest regular win (the jackpot) is 1000 coins. To win this jackpot you have the get 5 wild symbols in a row. 1000 coins can be worth as little as $10 and as much as $10 000 depending on the coin value you are using. 1000 coins is the maximum amount you can win on a single pay line. You can win more than this on a single spin if you are playing more than one pay line. Games from Nextgen gaming casino can be found in a large number of different casinos. The best way to find a casino to play in is to visit a casino review site and read their reviews for casinos that contain games from Nextgen. Examples of such casinos include Dunder casino, Spin casino, and jackpot city casino. You can also play the game for free by clicking here. Welcome to Pettoucan.com. A website devoted to toucans and how to care for them as pet birds. Why do toucans have big bills?